The small Principality of Monaco is the stuff of legends and intrigue, but it's also a fun place to visit. The Principality of Monaco, a quasi-sovereign country on the Côte d'Azur 21 km (13 miles) east of Nice (map), is famous for its ritzy casino and the wealth of its residents. Though small, it offers quite a variety of sights to visitors. The heart of historic Monaco is centered on The Rock (Le Rocher), the high promontory that is home to the palace of the Grimaldi family. It's also home to the Old City, the Cathedral, and the Oceanographic Museum. It's fascinating to spend an hour or so wandering its narrow streets, strolling in the beautiful gardens near the museum, or enjoying the many views of the town and the coast. 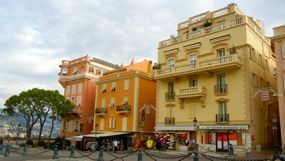 The lower center of Monaco, traditionally called La Condamine, today includes the busy port, with its many yachts and sailing vessels, as well as lovely streets and shops. Monaco is perhaps best known for Monte-Carlo, home of the famous Casino, as well as many luxurious villas, palaces, and shops. You'll see plenty of fancy cars here, as well as people in furs and jewels. Monaco also hosts the annual Grand Prix in May. It's hard to imagine cars racing through the narrow streets of the Principality, but they do each year. The Principality also is home to several museums, including the National Museum, with exhibits on the history of Monaco, and the Collection des Voitures Anciennes, housing over 100 old cars and other vehicles. 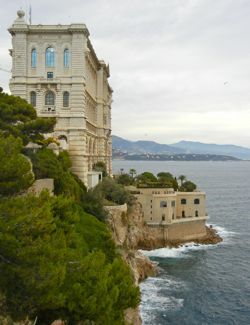 The Museum of Old Monaco, on the Rock, is notable for its sign in Monégasque. Monaco is an easy day trip from Nice. It's also very close to Italy if you want to continue your adventures in that direction. Above, Place du Palais, the Rock, Monaco.